There is no doubt that computing and computer science are huge part of both our economy and society. Technology changes at a huge rate and unfortunately the UK education system hasn’t kept up very well. At current ICT lessons mainly focus on how to use software – which is important – but do not attempt to address how these things are made in all but a few forward-thinking schools. A number of groups have done a great deal of work to attempt to change this, not least CAS, NAACE, STEMNET, BT, Intel and Microsoft amongst others such as Code Club and the Young Rewired State project. I am trying to provide help for teachers to gain computer science skills via local expertise through Computing++ and this is the story of how the project started. I jumped on the band wagon a few months ago when I taught a one-day workshop at the primary school where I am a governor. I decided to do this workshop because we had a focus on “More Able” pupils in our school development plan and I am a coder. The day was a roaring success and more than anything I came away with a really strong sense that the kids needed this kind of thing and it had to happen more. Since then I have been thinking about where to take the project and have gone through various ideas for repeating the day, running an after school club and so on. But as I thought about it more and more I couldn’t get away from the idea that this was something that should go a bit further than one school. I happen to have got to know a couple of people at Intel through getting involved with Meego (may it rest in peace) and I thought it might be worthwhile trying to get a bit of support from industry to put a bit of oomph behind things. I was put in touch with a chap by the name of Tim Hatch who looks after UK educational things for Intel and happens to be a member of Intellect, the UK technology industry trade association’s, education group. Tim gave me a crash course in the world of ambassador schemes, CAS, NAACE and so on. I had already come across projects like Code Club and Young Rewired State so all together I realised that there was a whole lot of great work going on already. 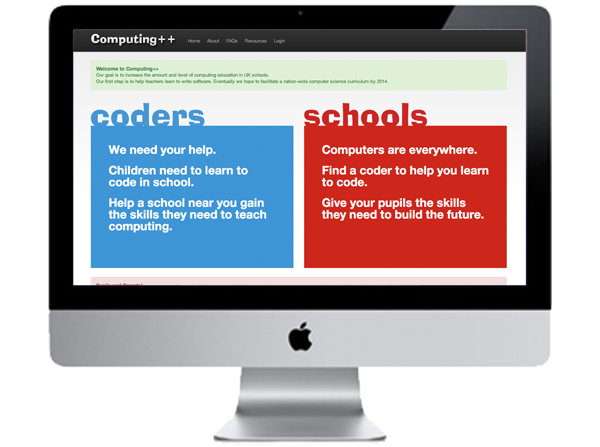 What struck me when I learned about all the existing schemes was that everyone was beavering away under the banner of “WE MUST TEACH KIDS TO CODE” but beyond individual projects it will always be down to regular teachers to deliver the vast majority of computing lessons if a computer science curriculum were to be put in place nationally, which I think we are heading towards. So, ok, sure. Spread the word that this is important. Win the hearts and minds of the nation, great! But, how many teachers actually know how to code? Erm… How about in primary schools? I’ll tell you how many – well some, but hardly any really. My big goal is the same as everyone else working in this area – get a computer science curriculum in place in UK schools. But, in order to achieve this I realised that there were really two things that I could maybe help with. The first is to provide a means for ‘normal’ teachers, particularly at primary level, to gain the confidence and skills with computing to be able to deliver lessons. Secondly, I decided that a common point of contact for the various large companies that already have ambassador schemes would help to align everyone as well as allaying some of people’s cynicism about big companies doing good things. I was a little wary of the potential for politics between some of the megalithic companies that might be involved but this seems to have been unnecessary as everyone is playing sickeningly nice (so far). On a fateful conference call with Simon Humphreys and Simon Peyton-Jones from the Computing at School group I agreed to take the lead in coordinating a link between industry and schools. Really, I took this on with the above goals in mind and already had a fair idea of what I wanted to odo but it was hugely helpful to become official and Simon and Simon were enormously helpful and supportive so I got stuck in! After a couple of weeks I had knocked together an initial prototype for the system. I had tried to position it as being big and bright and open with the aim of trying to entice people that are not totally convinced yet as well as hopefully making it media friendly (hint hint). I launched a few days before Eric Schmidt’s talk at the Science Museum and had a great response from the CAS membership. At the Science Museum event itself I was greeted more than once with “So you’re Martin then” which was both nice and a little disconcerting. I have a load of other ideas for the site but the ability to collect people is the most important and central feature so once that was functional I went live, all agile like. Schools (primary and secondary) that want to improve their computer science skills. Schools that already teach computer science and either want to share their experience or just want to show off (actually it would be great to get a picture of the number and distribution of schools teaching computing). Anyone who understands coding, software, how computers and the internet work and computational thinking and who wants to help nearby schools learn these things. When people first link up how should they start? The first thing is to work out what the school needs remembering that the end goal is to enable teachers to deliver computer science lessons. Primarily the expert will be working with a teacher NOT pupils. A great place to start is to teach the teacher a programming language, it doesn’t matter which (although Python and Java seem to get used a lot). It should be up to the teacher to steer the topic and the expert to fill in the gaps. Do the experts need a CRB check? If there is any possibility that you might encounter real actual children then yes. If you do not have an applicable CRB check speak to STEMNET about their STEM ambassador scheme and enhanced CRB service. They can also provide additional training if required. How do I find out more or get help if I’m stuck? For anyone who cares the CMS system is hand crafted on PHP / MySQL in Apache on a RHEL virtualised server. The interface uses Bootstrap from Twitter and a bunch of JQuery as well as Google Maps. The font used is AdLib BT.